Many thanks, Joyce Lynn, for curating the Wake Up! exhibit at Claudia Chapline Gallery , Stinson Beach, CA, and for the follow-up coverage in the Pacific Sun https://pacificsun.com/awakened-in-art/ as well as @ PlumDreamsMedia.com. Dreams of 1990’s Gulf War inspired Santa Rosa artist Marsha Connell’s ‘Dream Vessels’ series. Like surrealism, the political-art movement opposing totalitarianism in the aftermath of the horrors of WWI, the power of art and dreaming in these turbulent times holds the possibility for social change. Last week, less than a month before the 2018 midterm elections, a cadre of Northern California artists shared their art and held a dialogue to raise awareness about U.S. domestic and foreign policies in the month-long mixed-media exhibition “Wake-Up! The Political Power of Art and Dreams,” held at the Claudia Chapline Gallery in Stinson Beach on Oct. 28, that now continues online. 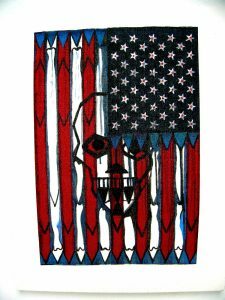 Works in that show included Flag of Death, created by artist and gallery owner Claudia Chapline, which graphically depicts the reality of U.S. foreign policy. Chapline says the piece came from a dream she had on March 11, 2006, the third anniversary of the U.S. invasion of Iraq. “I was standing on a ladder painting a large [American] flag,” says Chapline of the dream. “The stars resembled exploding bombs; the stripes, missiles. A skeleton’s head emerged from the war machinery. When I awoke the next day, I sketched the flag in my journal, and then I made a small painting from the drawing/dream. “For me, the flag painting symbolizes the discrepancy between American ideals and manifest American policy,” says Chapline. “I felt a distress so profound there were no words for it,” Connell says. 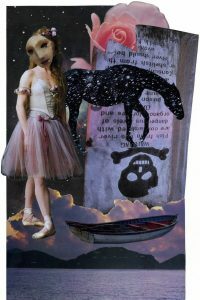 A friend suggested the dream meant the artist was to bear witness, and the collages became her way to communicate and begin a healing process that ultimately brought her peace. She calls the collages “Dream Vessels,” because each dreamlike picture contains a vessel. “The vessel offers the possibility of transformation, hope and reconciliation of opposites,” she says. In “They Never Stood a Chance,” a seven-foot-tall installation inspired by a dream, artist Jennifer Lugris envisions a metaphor for the North Korean government’s treatment of its people. “When I was a child, I watched my parents stack receipts on a paper spike at their dry cleaning business,” remembers Lugris, a first-generation American. “In mid-2017, I started having a recurring dream about life-sized paper spikes, except instead of paper, clothing was spiked through and stacked tall, towering over me,” says Lugris. Joyce Lynn is founder and editor-in-chief of Plum Dreams Media. See works from ‘Wake-Up! The Political Power of Art and Dreams’ at plumdreamsmedia.com. For centuries, dreams have guided nations toward (or away from) their destinies. Dreams have revealed the divine plan for countries, cultures, and citizens. Think of Joseph’s biblical interpretation of the Pharaoh’s dream proscribing public policy to prevent the Egyptians from starvation. Or consider the Roman philosopher Cicero’s Dream of Scipio imparting the essence of statesmen-like virtues. Abolitionist Harriet Tubman dreamt routes to safety for fugitives slaves during the 1850s. Her nighttime visions helped thousands of slaves escape to freedom via the clandestine Underground Railroad. In 1968, President Lyndon Johnson dreamt he was stuck in the middle of a huge river, unable to reach either side–signifying the Vietnam War could not be won. Weeks later he announced he would not seek another term as president, making way for Democratic peace candidates. Before the Presidential debates in October 2000, Amy S. of Sausalito, California, dreamt George W. Bush, “greenish with demonic eyes,” was “scratching like a dog” to break into her house. She was trapped. 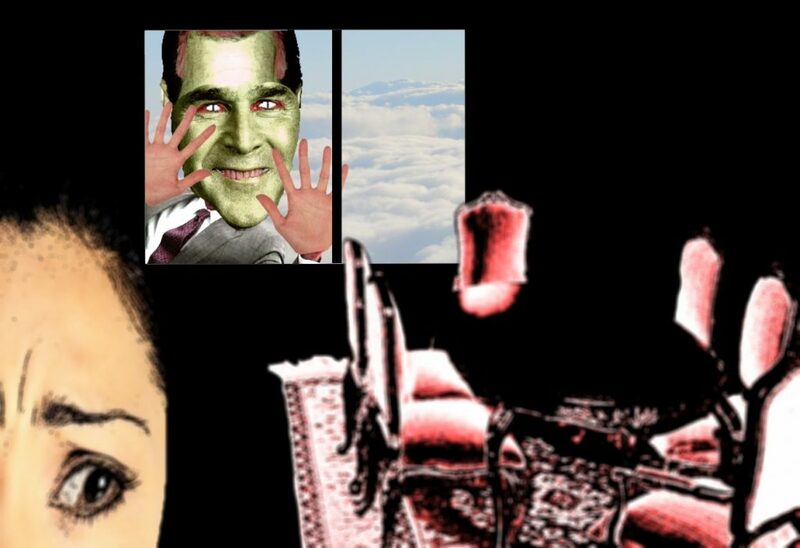 Amy’s precognitive dream (I call it “FrankenBush) foretold not only the Republican Party’s theft of the 2000 election, but the state police powers Bush imposed under the guise of fighting terrorism. Dreams have illumined the way of political activists from student Nazi resistance fighter Sophie Scholl to peace “mom” Cindy Sheehan. These dreams and dreamers show the profound power of remembering, understanding, listening to, and expressing our dreams. Our nighttime dreams upend government, corporate, and media propaganda. Once inner wisdom is tapped denial is impossible; positive action manifests. Such timely, insightful sometimes witty wisdom gleaned from dreams and depicted by artists can lead to personal and planetary well-being. Dreams give a picture of reality. Dreams enable us to see clearly, revealing hidden truths. When we listen to our own dream guidance, we the people can reclaim our power to govern for the public good. Like surrealism, the political-art movement opposing totalitarianism in the aftermath of the horrors of World War 1, the power of art and dreaming in these turbulent times holds the possibility of social change. “Wake-Up! 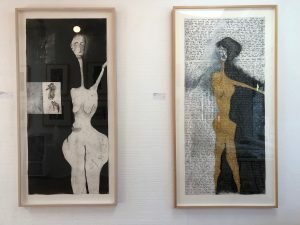 The Political Power of Art and Dreams,” a mixed media exhibition, was an exhibition at the Claudia Chapline Gallery, Stinson Beach, California, during October, the month before the 2018 Congressional elections to create dialogue and raise consciousness about U.S domestic and foreign policy. It continues online to expand its reach at PlumDreamsMedia.com. WAKE-UP! includes works derived from dreams by Northern California artists: Dream Vessels by MARSHA CONNELL; Flag of Death and other images of war by CLAUDIA CHAPLINE; works by artist-activist RICHARD KAMLER; FrankenBush, commissioned by PLUM DREAMS MEDIA; They Never Stood a Chance, an installation of remembrance and survival by JENNIFER LUGRIS; and a dream about Donald Trump’s Art of the Deal with God captured by NICOLE FRAZER. WAKE-UP! is an activity of the 50 State Initiative of ForFreedoms.org, a platform for civic engagement, discourse, and direct action for artists in the U.S.
A percentage of sales from the exhibition will be donated to Bay Area peace candidates. “I’m standing on a ladder painting a large (American) flag. When I awoke the next day, I sketched the flag in my journal, and then I made a small painting from the drawing/dream. The stars resemble exploding bombs, the stripes, missiles. A skeleton’s head emerges from the war machinery. Artist, writer, curator, Claudia has exhibited her paintings and sculptures since 1954. Her art has been shown in collections ranging from the Rosicrucian Egyptian Museum to the Thoreau Center for Sustainability. Claudia is a pioneer in the environmental and art as healing movement.Her exhibitions raise consciousness and make comments on contemporary society.She has written ten books of poetry and art. In 2006, Claudia received the Lifetime Achievement Award from the Northern California Women’s Caucus for Art. The Claudia Chapline Gallery and Sculpture Garden has shown Northern California contemporary art since 1987, a cultural crossroads for visitors to the Pacific coast and to residents of Northern California. 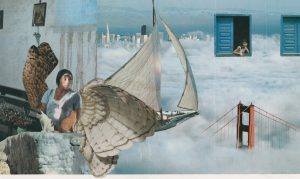 A month after the Iraqi invasion of Kuwait in August 1990, artist Marsha Connell dreamt that women writers, artists, and poets were brought to observe preparations for the first Persian Gulf War from the bottom of a hill. A voice boomed out: The women soldiers will go first!! This view that appeared in a dream began a healing process that ultimately brought her peace. Collages, dark landscapes spiked with light, became her way to communicate. “I felt a distress so profound there were no words for it,” Connell says. The Dream Vessels series took on its own momentum, now almost one hundred fifty images, printed in editions numbered up to twenty-five. 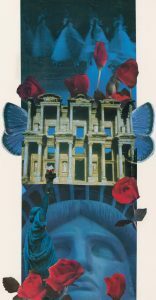 Like intimately scaled murals, the collages incorporate stories about family, culture, history, and the environment, including the devastation of ongoing wars, oil spills, firestorms, the disasters of Three Mile Island and September Eleventh, as well as simple pleasures and life’s mysteries, dance, music, motherhood. They also function as homages and memorials. The content emerged from dreams, and the process of creating them is like dreaming in the day, elusive and speaking in metaphor, gradually revealing layers of meaning to both artist and viewer. 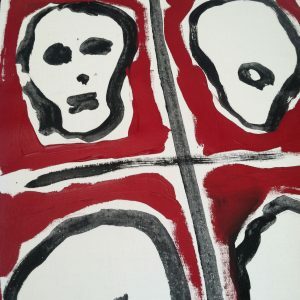 Imagery appearing in his dreams influenced the art of Richard Kamler, although the process of translating the imagery into art was for Richard, like for most artists, mysterious. His Skinny Figures series arose from dreams and from Richard’s 1981-83 artist-in-residence with prisoners on Death Row at San Quentin State Prison, California. The prisoners in the art classes became his friends. He took their last statements, humanizing the men. The phantasmagoria-like figures in Richard’s Skinny Figures drawings hover as if in purgatory — somewhere between life and death — analogous to the fate of those languishing on Death Row. Richard’s work with prisoners at San Quentin changed his work as an artist, launching decades of socially-oriented art. Other projects like “Seeing Peace” manifest this intersection of art and activism. Richard, who died in 2017, wrote, “Art (like dreams) can heal, reveal, and transform.” He saw the imagination as an active participant in the process of envisioning peace. In They Never Stood a Chance, the 7 feet tall and 2 feet squared width installation created from her dream is exhibited in “Wake Up! The Political Power of Art and Dreams” as one clothing spike. Jennifer envisions the initial spike as part of a series of spikes for a larger installation. The clothing has been bleached, a metaphor for the cleansing of its citizens of their free thought by the North Korean government. Jennifer’s paintings and installations are a reflection of a personal narrative of survival. “As a first-generation American with North Korea, South Korea, Argentina, Spain, and Uruguay roots, many circumstances needed to fall perfectly into place for me to be alive, ” she said. “In my paintings, I highlight the beauty within the everyday, the ordinary, and the mundane to show gratitude and appreciation for this opportunity. ​Jennifer was born in North Bergen, NJ in 1986. She earned her MFA from the University of California, Santa Barbara in 2018. 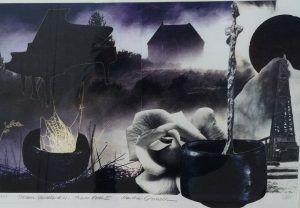 Her paintings have been exhibited and published internationally and have won prestigious awards. 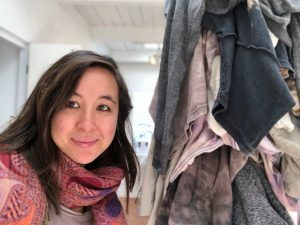 She received a residency at New Pacific Studio in Vallejo, CA as an Ernest J. Gaines Fellow, provided to artists for creative work engaging with issues of contemporary education and social justice. To raise awareness on social issues, she has curated successful fundraising exhibitions including Compassion, which aided Typhoon Haiyan victims in the Philippines; Pacha Mama, which supported the California redwoods, and SWAN Day, which raised funds for WomenArts a nonprofit organization in Berkeley. She currently lives in Sacramento, CA with her husband, dogs, cats, and chickens. Amy S. of Sausalito, California, in October, 2000, before the Presidential Debates, dreamt: “Darkness fills the house where I grew up. Something hovers outside the dining room window. It’s scratching like a dog to come inside. I move closer and realize it is George W. Bush. He is greenish with demonic eyes and a pale face. I am terrified and try to escape, but I feel I am trapped. He is finding a way to break in through the window. Amy’s dream not only preempted the stolen 2000 presidential election result, but her nocturnal message also tells of a presidential candidate, who would do (and did) anything to win; then during his eight years as president, metaphorically and literally, broke into our homes. Her dream predicted the 2000 election theft and expansion of State police powers. The dream prompts each of us to consider our dreams during the upcoming Congressional elections, to determine.if they impart clues for positive action, what it is, and how to implement it. Art of the Deal with God – monotype by Nicole Frazer. Ann R. of Pittsburgh, Pennsylvania, dreamt a dramatic scene April 3, the night after she watched footage of the White House Easter Egg Roll. From the balcony, Donald Trump with his wife Melania and someone dressed as a bunny Trump repeatedly called “Gary” or “Barry” by his side thousands of children and their parents celebrating the rebirth of Jesus bragged about the US military prowess and the economy under his regime. Ann dreamt of a family celebrating a child’s birth in a church while Trump sits at the head of a table shaped like a cross and makes a fascistic-Trumpian deal with God about hurting the child. Interested in the power of journaling dreams and interpreting experiences in a visual way, artist Nicole Frazer created the stained-glass-like illustration of Ann R’s dream using a process called chin colle. 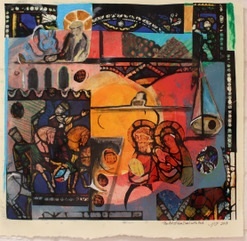 The monotype collage began as ink sketches of the three scenes Ann described after she watched media coverage of the Easter Egg Hunt at the White House. As Nicole formulated the composition and selected the materials, she found more symbolism emerged in the process. Nicole drew three scenes — Trump on the White House balcony with eggs symbolizing the commercialism of the Easter holiday; Trump at the top of the table in the shape of a cross, and Trump, like a king higher than anyone else. At the top of the illustration, the scale of Justice signifying Trump’s sadistic deal with God and the punishment democratic institutions will ultimately mete upon those who harm innocent children. “The table in the shape of a cross brought me back to the symbol of the crucifixion” and its connection to Easter. The ripped paper symbolizes broken justice,” Nicole said. 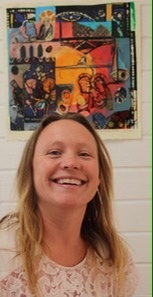 Nicole has a studio art degree from Scripps College, Claremont CA, and has worked in the museum field for ten years.